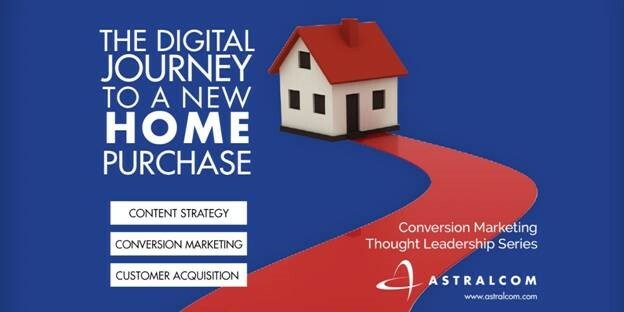 ASTRALCOM Defines the Digital Journey to a New Home Purchase | ASTRALCOM - Content Strategy, Conversion Marketing and Customer Acquisition. While the overall psychological process of consumers buying a new home and homebuilders selling a new home hasn’t changed, how consumers interact with homebuilder brands has. Moreover, the ways and means – the customer touchpoints – that consumers use to engage with brands is a fluid and constantly changing environment. Yet, amidst all that fluidity, marketers search for some method to the madness. Inherently, we all know there is at least one. There must be a “typical” buying process that homebuyers today use in deciding on the new home that they ultimately purchase. With 90% of home buyers searching online during their home buying journey, it makes sense for marketers to understand that process and how typical homebuyers use the internet as a way to engage with, and ultimately decide on, purchasing from a new homebuilder. We know from research and experience that higher cost items (like a new home purchase) require more content to support a sale, than does a lower cost item (e.g., mp3 player). If you’ve read our Social Commerce Tactical Guide for 2015, then you’ll understand the age-old internet axiom: Content is king. But what kind of content? How should it be used? When? • Understanding the homebuyer journey. • Recognizing channel syntax: What channels and when? • Defining appropriate content: Which content goes where? Using Content to Connect with and Engage Homebuyers throughout the Digital Journey to a New Home Purchase will aid homebuilders in developing a quicker affinity and deeper engagement with homebuyers throughout the online journey to a new home purchase. 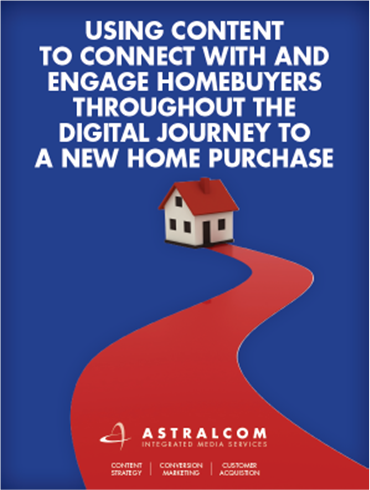 Download your FREE copy of Using Content to Connect with and Engage Homebuyers throughout the Digital Journey to a New Home Purchase. This article is part of the Conversion Marketing Thought Leadership Series.